How can retail banks generate curated experiences? Learn from retailers. They use a cloud platform that orchestrates experiences from omni-channels to devices using data collected from various touchpoints. The data is combined and analyzed with Microsoft Azure Machine Learning technology. With these technologies, retailers can now understand the shopping behavior of a customer and offer them products that that are most relevant. Retailers deliver engaging in-store experiences by digitizing the store to deliver a curated experience to the shopper at every point in their shopping journey. Imagine this: banks that provide financial “fitting rooms” where customers can “try on” products and services before they commit. That gives the customer the ability to experiment with the recommendations that fit their holistic life, not just their financial life. That feels a lot more personal and custom fitted to me. Convergence! Wasn’t there a movie with that title? No, sorry, that was actually Divergent. Exciting sci-fi thriller where people are divided based on virtues, but that’s going in the wrong direction for this topic. So, what’s converging? Retail experiences are giving customers new expectations about banking. Consumer expectations are being shaped by customer experience leaders outside of banking. Digital transformation in the retail banking industry has intense customer focus and all players are looking towards lean operations and delighted customers. Traditional activities will not sustain the same historical levels of revenue. These include direct/indirect marketing, customer requirement analysis and product design, advertising, campaign management and branch lobby leading. Instead, retail banks will need to build a much larger digital footprint through targeted marketing. This is done using big data, advanced analytics for product design, predictive demand modelling, elasticity modelling for pricing, and conjoint analysis for product configuration. In the past, it was common to extract data to produce propensity models that hypothesize why customers leave. Those days are over. If retail banks really want to know precisely when to offer the next product, or why an experience won or lost the customer’s heart, they will have to pursue a combination of the following: augmented intelligence (via bots/agents, robo-advisors, intelligent automation), fintech partnerships/coopetition, predictive analytics, IoT, big data, and strategies for future possibilities (Virtual Presence, Augmented Reality, Seamless life integration). So, what do retail banks need to do to innovate and evolve? Spend some time looking at the convergence of retail banking and big box retail. Dissect what the big box retailers are doing. The retail banking experience will be influenced by the big box retailer customer experience. For perspective, here’s how big box retail has evolved. In the 80s, Mass Merchandise was all about ready-for-pickup on display in retail stores. Walmart perfected the art of get-it-right-now-don’t-wait. In contrast, retail banking today has many processes that takes a week to land. Small loans and credit cards still take days to fulfill. Starting in the 90s, in terms of Mass Market E-commerce, Amazon could ship anything from anywhere. The customer also had detailed product information, social proof, and price comparisons at their fingertips. When was the last time your bank provided you with reviews from other consumers who have the product you are interested in? In the mid 2000s, Retail 4.0 - Digital Transformation began. Then accelerated by blending the physical and digital experiences. Retailers created online-like experiences in stores by leveraging advanced sensors, digital devices, and the computer in your pocket. Great examples are showcased in Microsoft retail stores and Pier 1 Imports. More and more, digital transformation in retail means custom-made, specially produced, and made-to-order at the point of sale—not just inside the store. And the convergence of these industries will ultimately drive high customer expectations for banks to provide the same. What big box practices need to be implemented by retail banks? For starters, the retail bank of tomorrow will need the agility to navigate the customer through blended physical and virtual experiences. The customer can be in the branch, online, or on the phone. The experience will be guided using big data analytics and social channels to deliver holistic personal customer experiences based on customer goals—financial and non-financial. Retail banks will effectively blend humans with digital advisors and intelligent agents. And the branch of the future will reflect all these elements in one integrated experience. The experience will provide customer-centricity, cognitive and contextual interactions, innovative personalization, and high levels of trust. Develop a curation strategy aligned with the overall business strategy. Read the customer experience orchestration paper to help you get started with this step. Democratize artificial intelligence and make it an enterprise-wide capability. Read the Data Management in Banking Overview to help you get started with this step. Prioritize the data to be leveraged for analysis and insight. Find the right mix of curated experiences. Start with a clearly defined proof of business value for those experiences. 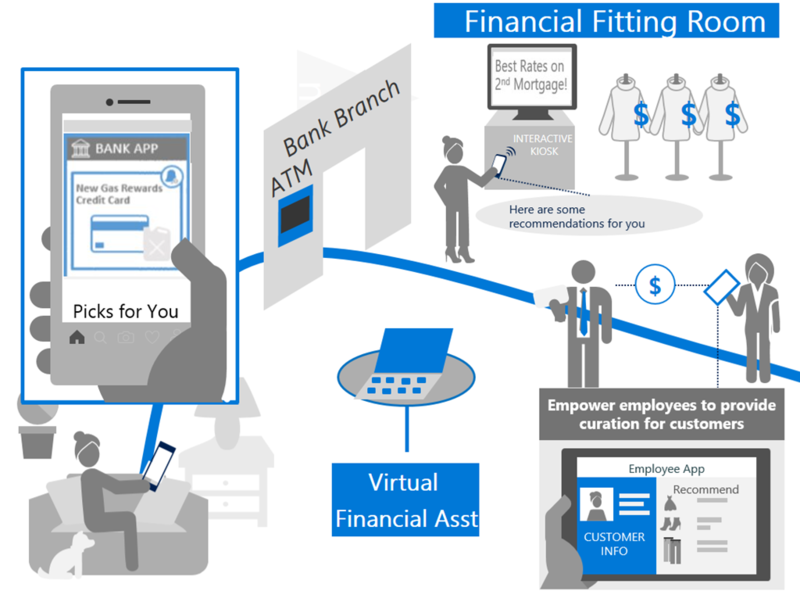 Delivering curation at every touch point throughout the financial shopping journey cannot happen without a rich platform like Microsoft Azure to orchestrate the curated experience. To engage with me on additional ideas and recommendations, contact me through Linkedin and Twitter.